‘We Are Planet Perfecto’ is the first in a new compilation series from dance pioneer Paul Oakenfold that reflects the diverse, non genre-conforming sounds that have given him the legendary status he holds today. Equally comfortable playing glitzy celebrity parties at theOscars or Milan Fashion Week as he is rocking festival main stages or underground trance raves, Paul Oakenfold’s love for quality melodic music refuses to be pigeon holed to any single area of the scene. 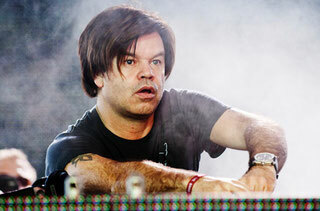 Both CDs are packed with Paul Oakenfold’s freshest productions and remixes – including his amazing vocal collaborations with Tamra, his single with Infected Mushroom called ‘I’m Alive’, the smash hit on Perfecto Fluoro ‘Full Moon Party’ and his blissful cover of ‘Sleep’, forthcoming on Perfecto. With a tracklist that features no less than 20 Perfecto and Perfecto Fluoro releases (including the killer Goa single from Protest Movement and Paul Webster’s amazing remix of ‘Southern Sun’) – the album is also a call to arms for the new line up of exciting acts now fronting Paul’s Perfecto Labels.